Is home-buying your New Year’s Resolution? Identify your wishlist, research your local real estate market and connect with the professionals who can help you find and close on your dream home this year. Author kimhuntkwPosted on January 28, 2015 January 2, 2015 Categories National Housing NewsTags home buying, how-to, tipsLeave a comment on Is home-buying your New Year’s Resolution? Looking for a new look in the New Year? Whether your construction or design aspirations are small or large scale—getting to the middle of a project and realizing you’re lost or out of resources can be an overwhelming feeling. Many people choose to hire an architect when they know that there are limits to what they can personally provide, or they simply want to know that the project is in the hands of an expert. Hiring an outside professional in any capacity takes a certain amount of open mindedness, however, when you’re considering hiring an architect, it’s imperative that you understand the flexibility required in projects. Architects are hired on with a wealth of knowledge to contribute, so be willing to listen and take their expert advice. Having a clear understanding of what you want for final results will only help, but being open to professional suggestions will create a smooth path to a successful project completion. Author kimhuntkwPosted on January 2, 2015 Categories Real Estate TipsTags home building, tips, trends1 Comment on Looking for a new look in the New Year? Scott SchaeferArmy veteran Richard Kuri, 81, used his VA loan benefits to purchase a home this summer with $0 down. Richard Kuri had a beacon guiding him along the homebuying journey. Consider it one of the benefits of buying down the road from a lighthouse. 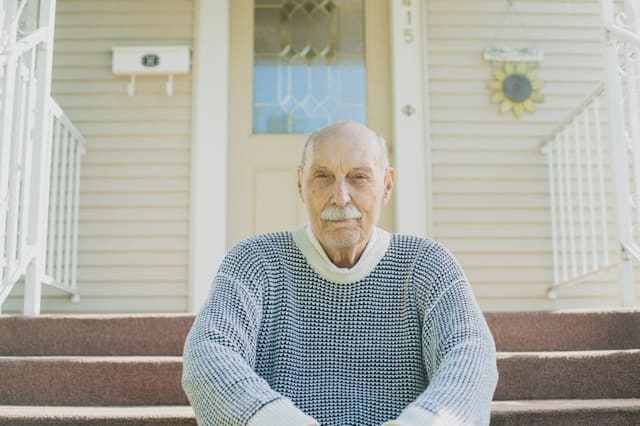 The 81-year-old Army veteran closed this summer on his dream home, just three blocks from the Lake Michigan shoreline. Two years removed from a bankruptcy discharge, Kuri was able to land a loan using his VA mortgage benefit. A whopping 1 in 3 aren’t even aware they have a home loan benefit…. earned by his service to our country. VA loan volume has skyrocketed since the housing crash. Veterans and military families have flocked in record numbers to this $0 down mortgage in a time of tight credit. But millions upon millions of veterans are still missing out. About 10 percent of the country’s 22 million veterans currently have a VA-backed loan. A whopping 1 in 3 homebuying veterans aren’t even aware they have a home loan benefit, according to survey data from the Department of Veterans Affairs. To be sure, VA loans aren’t the best fit for every military buyer. But they should at least know it’s an option. Scores of veterans and service members have an incomplete home financing picture. Simply making sure they’re aware of the home loan benefits earned by their service can help ensure veterans get the best deal possible. Big-Time Benefits: The government created the VA loan program as part of the original GI Bill. Envisioned as a short-term benefit, the program aimed to boost the postwar economy and broaden access to homeownership for returning veterans. Seventy years later, VA loans are still fulfilling that original mission. Rather than make home loans, the VA basically insures a portion on behalf of eligible veterans and service members. That fiscal guaranty helps gives lenders the flexibility to extend financing with some significant benefits, chiefly the ability to purchase with $0 down. Time to return the favor! ShutterstockA major issue to consider when buying a home for your parents is whose name goes on the deed. It’s fairly common for parents to help their children buy a home. But sometimes, adult children are in a position where they want to help buy a home for their parents. It may be that the children have been successful and want their parents to have a better home than they do now. Perhaps the current housing no longer meets their needs. Maybe the parents live some distance away and the children wish to have them nearby, but housing costs in the new location are considerably higher than where they live now. Or the parents may need a retirement dwelling but can’t afford to make the move on a fixed income. 1. Buy a home for them outright and allow them to live there. 2. Assist them in buying a home if they’d have difficulty obtaining a loan by themselves. 3. Buy a home and rent it back to them at an affordable cost. Coupled with these are questions about financing, title, taxes and the eventual sale or inheritance of the property, which vary among the three options. 1. Buying the Home Yourself: If you’re planning to finance the purchase of the home yourself, you probably have significant assets to draw upon. In that event, Malcolm Hollensteiner, director of retail lending products and services for TD Bank in Cherry Hill, N.J., recommends leveraging those assets rather than financing the property through a regular mortgage. “If the financing is in their (the adult child’s) name but they don’t intend to occupy it as a primary residence, the lender will view it as a second home or an investment property,” Hollensteiner said. That could mean paying a higher interest rate and more in closing costs than on a primary residence. Author kimhuntkwPosted on December 8, 2014 December 8, 2014 Categories Real Estate TipsTags home buying, tipsLeave a comment on Time to return the favor! For all your relocaters out there! Here are some tips for buyers and sellers in any market. The days of a national estate market are gone. Today, markets vary by state, town, city and even block by block. But most people don’t realize this. So it’s important to start by researching the hyper-local market of the town or neighborhood that interests you. Read local blogs. Watch the number of days a home is on the market. Understand the sale price to list price ratio in the town where you’re buying. Upfront research can save you a lot of time and headaches. Plus, you don’t want to rely entirely on your real estate agent to tell you about that market. Get informed on your own. Selling your home in a buyers’ market can subject you to a harsh reality. Your market could be slow due to a high level of inventory, low demand from buyers or simply slow economic times. If you need to sell in a buyers’ market, put your best foot forward from the start. Make sure your home is priced to sell. You may not have the luxury of waiting for six months to test the market. Homes will sell, no matter the market, when priced right. Spend days or weeks removing junk and prepping your home for the market. You’ll have to pack up when you move anyhow, so it makes sense to start packing before you even list your home. Not only will it save time later, but it will help thin out the house, make more space available and help the home show better during open houses. Strongly consider any suggestions your agent makes for slight cosmetic fixes or staging. Who doesn’t love being a buyer in a buyers’ market? You have lots to choose from and the full attention of sellers. Take your time to see as many homes as possible to get the lay of the land. Focus on the most motivated sellers, as this is where you may uncover the best values. If a handful of homes meet your needs, ask questions such as: Why is the seller selling? What is the seller’s time frame for moving? How long has the seller lived in the home? You can ask these questions through your agent or by asking the seller’s agent directly. The more you ask, the more you may uncover just who is the most motivated seller. Be open to taking on some renovation work, because that can add value to the property. The market will eventually turn, and there’s no better feeling than knowing that you bought low, with some bonus equity. If you have the luxury of receiving multiple offers, focus on the best buyer and the best terms and not so much on the bottom line. You want the buyer who is going to close. The last thing you want is to have to go back on the market. When this happens, everyone will wonder what’s wrong with your home. It could be that the buyer got cold feet or remorse. If you aren’t sure who is the best buyer, ask your agent. The best buyer is the one who has seen the home multiple times, is pre-approved for a loan, has been in the market and has even lost out on recent home sales. This buyer is working with a local agent and committed to buying. Your agent will know who they are. Author kimhuntkwPosted on October 13, 2014 Categories Real Estate TipsTags home buying, home selling, relo, tipsLeave a comment on For all your relocaters out there!